If you are interested in data visualization and of using visual tools to tell a story, I suggest that you head over to the Flowing Data blog and check out Nathan Yau’s excellent post on Spotting Visualization Lies. As Yau points out, not every misleading data graphic is necessarily a lie. Often, the graphic maker is truly trying to do the right thing, but makes choices which obscure the real meaning in the data or even lead to a thoroughly erroneous conclusion. But one place where I am pretty sure that visualization lies are used with the intention of deception is in climate change denial. 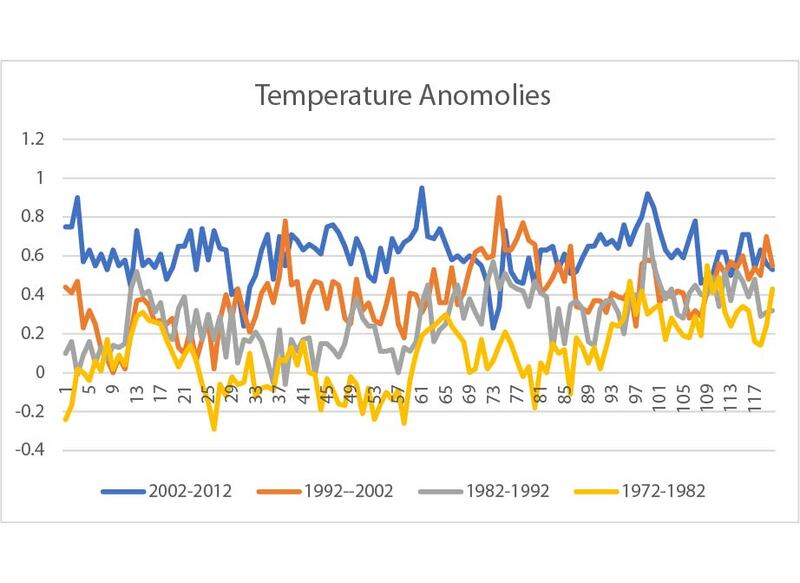 A glaring example of visualization used to tell a lie is in Watt’s Up With That’s recent post “Is the recent global warming slowdown real, or is it fake news?” by guest blogger Sheldon Walker. Two things immediately popped out at me. First, I knew the answer that WUWT would publish – Of course the pause was real! long before reading the article. And second, captured in the title, and reinforced in the article is the admission that even if the pause happened, it is over – after all 2016 and 2017 were record hot years. Walker starts with a bit of analysis. 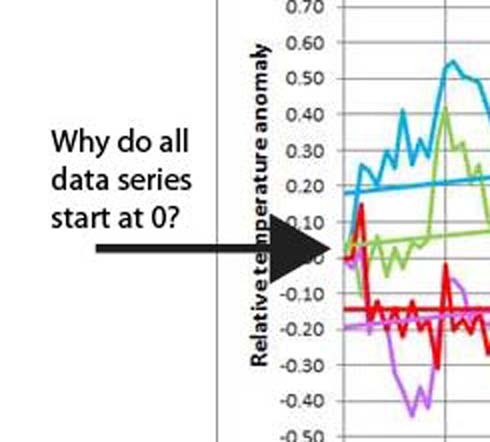 He looks at the years from 1998 to 2015 to find the slowest rate of warming. He never fully explains how he calculates the warming rate, but I’ll take his word that the calculations are meaningful. The result, he finds that the period o 2002-2012 was the slowest warming period, increasing at a rate of .09 degrees Celsius per century. here is the chart. 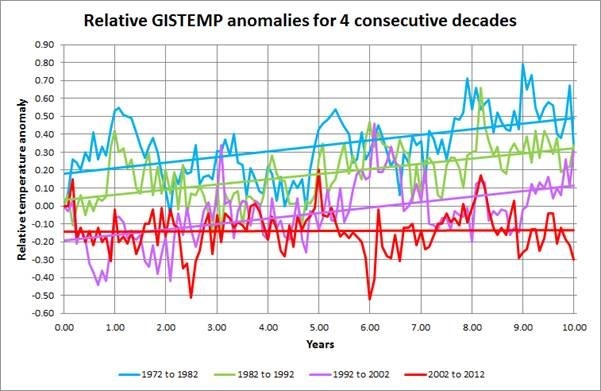 OK – so the period from 2002 to 20012 was a period of slow warming- but slide the analysis one or two years in either direction and the picture is very different. Was this 10 year period just a random fluctuation? 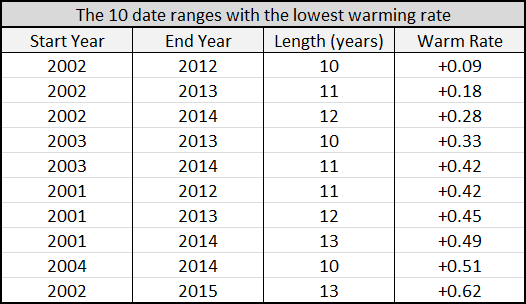 So the first lie in the analysis is that Walker never goes back over the data from before 1998 and asks how often are there 10 year stretches with .09 degree warming? At this point, for all we know this is well within the bounds of randomness. To compound the lie, Walker produces a chart, where he compares the period of 2002-2012 with 1992-2002, 1982-1992. and 1972-1982.